A great annual report goes far beyond just reporting on the numbers. It seeks to capture the spirit of what happened through stories and visuals. We recently helped the Maine Technology Institute (MTI) with their 2018 Annual Report that covered a record-breaking year for them. Cinnamon rolls, to-die-for chocolate chip cookies and richer brownies than any bakery in town. When Elise Richer decided it was time to open a new retail bakery in Portland, we were thrilled to help her with the branding—mostly because we wanted to know these amazing treats would be available close-by on a regular schedule. We had worked with Elise on her previous, home-based bakery: Cream & Sugar so we were familiar with her overall approach to baking but like her, were eager to do something new and fresh with Tin Pan Bakery. 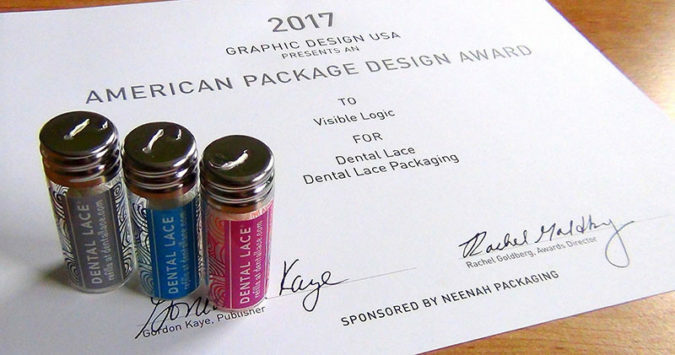 Dental Lace branding wins an American Package Design Award from Graphic Design USA for design of the refillable dental floss package. It’s always a pleasure to help a company or organization portray themselves more professionally by redesigning their logo. While it can be tough to track logos to real ROI for businesses, an updated brand identity can signal to internal members and external audiences a new direction for a business or just renewed pride and energy as you continue on in the same direction. 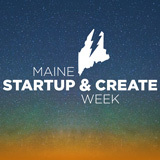 We have been really busy with Maine Startup and Create Week. In addition to attending many great sessions, we were heavily involved with organizing and marketing the event. As a key member of the marketing committee, Visible Logic helped to develop the key messaging, update the branding and create pretty much all of the printed signs, schedules, ads and printed marketing materials.